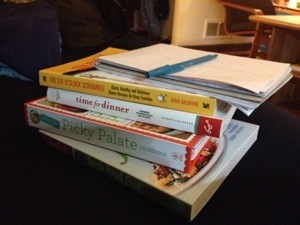 There’s nothing like a wild Friday night of grocery list-making and meal-planning – whew, good times! I got some new cookbooks for Xmas that I’m pulling heavily from this week; 4 of the 6 dishes here are new, though with familiar flavors and ingredients. I also have scoped out some backup meals for which I’ll have ingredients in the fridge/pantry – Spanish tortilla or Swedish meatballs – in case work blows up on me and I forget to defrost something, or any other mid-week weirdness occurs. Because, you know, it does sometimes. So now that my lists are all made, I can enjoy a slow Saturday morning with the kids while Tom gets us a new tire; small luxuries! Have a great weekend, everybody.